City Attorney Dennis Herrera today formally subpoenaed Millennium Partners as part of his office’s investigation into whether the developer complied with state law by disclosing known structural sinking issues to purchasers. SAN FRANCISCO (Sept. 20, 2016)—City Attorney Dennis Herrera today formally subpoenaed Millennium Partners as part of his office’s investigation into whether the developer complied with state law by disclosing known structural sinking issues to purchasers of more than 400 residential units in the Millennium Tower. News accounts revealed last month that the luxury highrise at 301 Mission Street—which opened to occupants just seven years ago—has already sunk significantly beyond the one-foot settlement limit builders projected during the building’s entire lifespan. The 58-story tower sank fully 16 inches since its 2009 opening, according to reports, and now leans by two inches. According to an engineer hired by Millennium homeowners, the tower is continuing to settle at a rate of about one inch per year—and will likely continue sinking up to 15 inches further into landfill. In the administrative subpoena served on Millennium Partners I, Inc. this morning, Herrera acknowledges that his demand for evidence is “in furtherance of an investigation.” Both the subpoena and Herrera’s accompanying cover letter cite a provision of California law that requires real estate owners to provide “Mandatory Real Estate Transfer Disclosure Statements” to purchasers that offer extensive detail about property conditions. “I have serious concerns that the disclosures required by state law…did not contain information about the settling of the Property,” Herrera wrote in his letter. Millennium Partners chose a concrete platform as the structural foundation for its Millennium Tower project, with piles driven approximately 80 feet deep into sand. That engineering decision at the center of the recent controversy contrasts with construction practices by developers of such nearby highrises as Salesforce Tower and 181 Fremont, whose foundations rest on piles drilled some 200-feet into bedrock. Herrera’s investigation is being led by his office’s Complex and Affirmative Litigation Unit, which investigates and pursues civil litigation involving unfair and unlawful business practices. 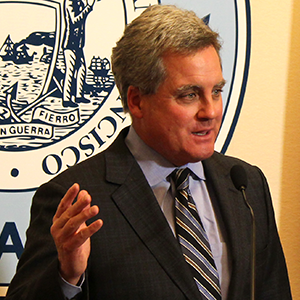 More information about the City Attorney’s Office’s is available at: https://www.sfcityattorney.org/.